Raju Gari Gadi, which hit the theaters on Friday is minting money. Directed by Omkar(Television fame), the movie is being immensely praised for its comical horror. The makers have successfully dished out the right proportions of necessary elements for the movie. Under the genre of comedy-horror, the movie has managed to gain the praises of all quarters of people. So, the team has decided to add screens for the movie in both AP, Telangana and also overseas. 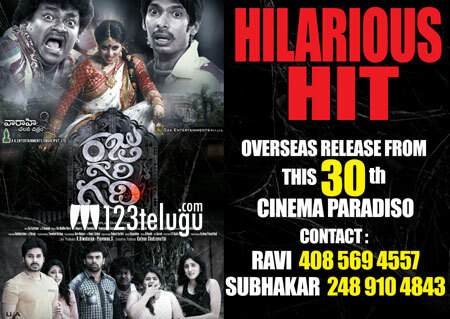 Raju Gari Gadi is all set for its overseas release on 30th of this month through CINEMA PARADISO. Interested people can contact: 4085694567/Subhakar-2489104843 for any kind of details regarding the tickets, show timings etc. The whole team is being buoyed by this super hit talk. Omkar who was waiting for a chance to prove his caliber is on high moods now. The movie has got very good reviews and the talk is being spread all over that the movie is very entertaining. Congratulations to the whole team. It is so happy that low budget movies are adopted well by the audience and made hit.